Standard size 1 5/32" 1 1/8" Fiberglass shaft Larger size 1 9/32" Standard Blade 8"x19" Blade size 8" x 17" Blade size 8" x 21"
The standard for camps, liveries and wilderness tripping. The Canoe Paddle is durable and quiet. Time tested materials and process, makes a paddle that will last for years. If you are tired of wearing out or breaking paddles this is the paddle right for you. For camps and liveries flatwater use this paddle is warranteed for 3 years full replacement on materials and workmanship! An investment that will last. The Canoe Paddle comes in a 8" blade width, with riveted aluminum tip guard. Blade lengths from 17" to 21" in 2" increments. The standard blade size is 8"x19". 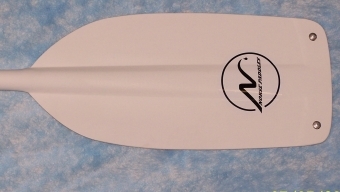 The Canoe Paddle blade design comes in 3 shaft options. The standard Norse paddle shaft is made with a proprietary process of an epoxy/Dynel/durable film matrix and is compression molded to a 1 1/4" or 1 1/8" diameter 6061-t6 aluminum seamless .035" wall shaft. The 1 1/4" shaft outside finished diameter is approximately 1 9/32" and the 1 1/8" shaft finishes at aproximately 1 5/32" diameter and is the standard size for The Canoe Paddle. Or the choice of the fiberglass "skypole" shaft outside diameter is 1 1 /8". The flex of fiberglass provides less fatigue to the paddler. The shaft comes ovaled above the throat for control you can use. 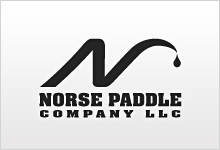 Paddle lengths from 48" to 63", see our guide on how to choose the proper canoe paddle length. These paddles are made to order. Paddles usually ship within 7 days of order payment .You will be notified by e-mail when your order ships.